Part of your role as a student pastor, regardless of church size and context, is to recruit and train leaders to join you in your mission of making disciples. Often, this task is one of the most challenging ones that you face because it will force you to make tradeoffs with your time. I know that this ministry is called “student” ministry, but if you are spending all of your time with students you are missing the mark. Your ministry will be much more effective, and your ability to reach and disciple students will be far greater if you begin to spend more time recruiting and training volunteers to join you. How much time? Good question. I don’t think there’s a magic number here. I’ve heard some talk about spending ⅓ of your time with parents, ⅓ with students, and ⅓ with volunteers. That sounds nice and clean, but as you know ministry rarely fits into nice and clean spaces. I think the amount of time is different depending on where you are in ministry, and I don’t mean location. What is the state of the ministry? If you are re-building then you may need to spend more than ⅓ of your time with leaders in the beginning in order to build a solid foundation. If you forced me to answer this question, I would recommend at least ⅓ of your time, and probably more. Your effectiveness in ministry is largely dependent upon the leaders that you recruit and train to come with you. I have seen this reality play out far too often to ignore it. 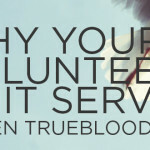 Over the next 4 Tuesdays I want to look at what it takes to be a successful volunteer. Let me give you a hint: it’s a lot more than someone who is breathing and willing to show up every week. If that is our standard, then we aren’t doing the ministry or the students any favors. The good news is when we know what a successful volunteer looks like, we are better equipped to train and develop them for success. Make sure that the leader you are recruiting shares your vision and direction for student ministry. Spend enough time with them so that you can articulate what they believe about student ministry before you put them in a place of service within the ministry. Another thing to remember is to ask them what they believe before you explain your own vision so that they aren’t just parroting your beliefs. You want to get their initial unfiltered reaction to this question. If they believe something different than you, or they don’t have any belief about student ministry at all, it’s not the end of the world. The key question to ask yourself at this point is: “can I develop this person’s vision for student ministry?” Your answer to that question is critical to whether or not you move forward in the recruiting process. Avoid someone who sees student ministry differently than you do. It is better to have an empty seat than to have someone who will constantly be taking students in a direction contrary to where you are leading them. This is different than someone who will offer constructive criticism, we need those people around us. This is someone who fundamentally disagrees with you about what a student ministry should be and what it should accomplish. If you can’t develop them to align with the direction God has given you, then they don’t need to serve with you. When your volunteers share your vision and heart for student ministry you are well on your way to building an army of student disciplers. This process is worth the time because of the Kingdom impact that can be made. The simple truth is that you can do more as a team than you can as an individual. 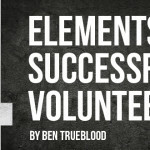 Join me on Tuesdays this month as we continue to look at the elements of a successful volunteer.